Art and jewelry merge at this year’s Biennale des Antiquaires. At this biannual event, collectors are presented with high fashion jewelry created by top designers. The jewelry is rare because designers craft pieces to reflect famous artwork. To create these pieces, jewelers are pulling their inspiration from artists like Impressionist painter, Monet and Dutch artist, Mondrian. The result is a unique set of designs driven by the tastes and preferences of modern art’s most significant influences. ~Claire Dévé-Rakoff is creative director at Chaumet. She insists that color will take precedence over stones this year. Her palate was comprised of soft pastels pulled straight from the Impressionist era. In fact, she directly references Claude Monet when mentioning Chaumet’s theme of light and water. 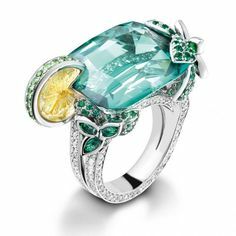 She is especially interested in the way light and water play together and the color combinations that are created as a result; yellow diamond and blue sapphire, for example. ~Chanel also plays with light in its Sunset collection. The work conjures the emotion and calm of pink and golden sunsets. White diamonds and pink sapphires mix with pastel opals to imitate the streaks of color seen at dusk. Their centerpiece, a necklace of white and pink gold, surrounds a sapphire with subtle hints of orange. ~A designer returning to the show this year, Wallace Chan of Hong Kong, found inspiration in the work of Piet Mondrian. Chan’s attraction to geometric shapes and clean lines was due to, what he called, “a quest for purity.” Bright green garnets and tourmalines contrast pink rubelittes and sapphires in a gorgeous ring. ~A newcomer to The Biennale, Giampierro Bodino, calls on Italian influences and colors, particularly those of Renaissance painter, Sandro Botticelli. No doubt there’s a bit of national pride behind the Milanese designer’s work, as Italy, perhaps more than any other country, has a rich heritage of art and culture. Pastels and vibrant colors are present here, providing beautiful combinations. A cuff designed by Bodino is made up of green chyroprase which sits inside purple sapphires and diamonds of white gold. Another cuff features light pink opals set against pink sapphires and diamonds, mounted in rose gold. It is a year of new influences at the 2014 Biennale des Antiquaires. Well, new influences that, at the same time, happen to be old. Top designers found a wealth of inspiration for color and tone in the works of famous artists of the past. This inspiration is credited with producing collections of vibrancy, elegance, and simplicity. It’s a communication between the arts. Indeed, it’s like a miniature renaissance in jewelry.